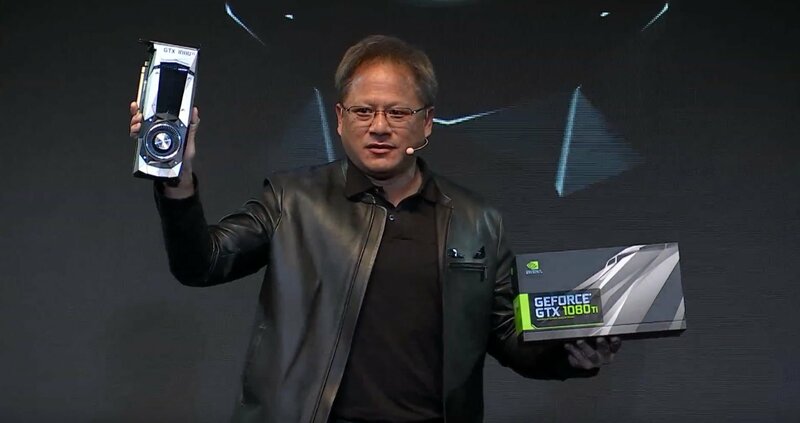 After AMD’s relatively boring Vega launch-less Capsaicin & Cream event this morning, Nvidia’s Gaming Celebration event was a lot more exciting as the company introduced their latest Pascal based beast, the Nvidia GeForce GTX 1080 Ti. Based on the 16nm FinFET Pascal based GP102 GPU used in the Pascal GTX Titan X, the GeForce GTX 1080 Ti is one very seriously powerful graphics card, featuring 3584 CUDA cores, 224 TMUs and 88 ROPs. Boost clock speeds are set at 1.582GHz, with additional overhead for overclocking. The GTX 1080 Ti will also come with 11GB of Micron’s latest 11Gbps GDDR5X running on a 352-bit memory interface providing the GTX 1080 Ti up to 484GB/s bandwidth. TDP is rated at 250W, which is the same as the Pascal GTX Titan X. What does this mean in terms of performance? A not too shabby 35% performance increase over the non-Ti GeForce GTX 1080. It also slightly edges out even the beastly GTX Pascal Titan X in both memory bandwidth and compute performance. What’s most surprising about the Nvidia GeForce GTX 1080 Ti is that it’ll carry a pricetag of just $699 when it launches on the week of March 5. Considering the GeForce GTX 1080 Ti features Pascal GTX Titan X level of performance without the $1,200 pricetag, this is literally Nvidia competing against themselves. As a result, Nvidia is also cutting the pricetag of the GeForce GTX 1080 Founder’s Edition to $549. Why the pricing? It may have to do with AMD’s impending Vega based graphics cards that are expected to arrive before the end of the 1H2017. However, with a Vega launch missing at today’s AMD Capsaicin & Cream event, it looks like Nvidia is once again the only choice for the enthusiast graphics. More about the GeForce GTX 1080 Ti can be found on Nvidia’s website here.